Save the Date for the 4th Annual Ultimate Tailgate Party! Everyone is talking about fall’s arrival, and while we happily enjoy the remaining days of summer, there is something special about the fall here at Lovin’ Spoonfuls. 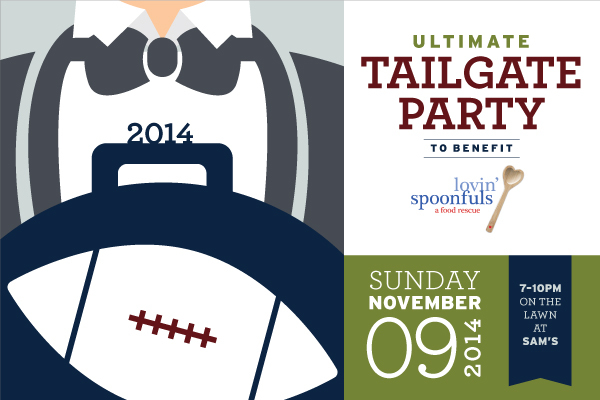 We happen to think it’s because of our signature event, the Ultimate Tailgate Party! This year, as we celebrate our upcoming 5 year anniversary, we are looking to make it our most successful event yet! It will still be on the lawn in front of Sam’s, but this year we’ll be under a larger tent, with a few new surprises! So, save the date, details coming soon and tickets will be on sale in the coming weeks – but mark your calendar now so you’re sure to be there. The party takes place on Sunday, November 9th!